I stumbled upon what is known as 'Science Communication' through my interest and love of science & talking & writing. I love sharing ideas and thoughts and meeting new people so I have become actively involved in 'communicating science'. I have communicated to school children, fellow students & strangers. The people I have spoken to have been interested in what I have had to say. I started this blog because it seemed like a fun thing to do in between waiting for experiments to finish. I get annoyed with news articles that do not present data/facts & research correctly. I read BadScience and LOVED IT. I even joined Twitter (after refusing to for many years) after finding out that there is quite an active science community on there. 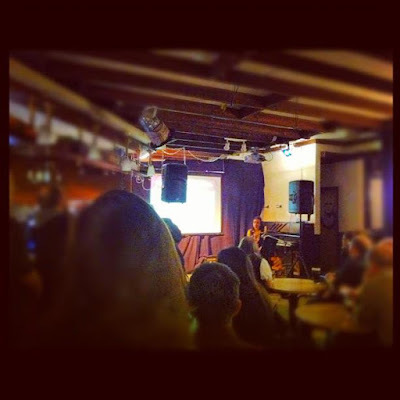 I am based in Aberdeen, I moved up from London so I do not know that many people, I wanted to meet more science geeks up here I am (along with a science geek colleague) starting a Skeptics in The Pub meeting as a platform for people to meet. So this is my 'science communication' journey. What I didn't realise until a few weeks ago is the massive debate that is going on about how to communicate science. I am including within this debate the skeptics (which are too militant), the bloggers (that blog but do little else), the journalists (which seem to debate endlessly on how things should be done), the academics who are a mixed bag... this is just the impression & some of the views that have been expressed by people since I 'joinined the scene'. The whole scene like many other scenes is quite elitist, mostly run and governed by a select few that interact with the media already. So why the constant put downs within the 'science communication' group of people that don't do enough or do things in a way that other people dislike? I thought the whole scene was based on a shared interest in science (or maybe I was being too naive there) and encouraging a wider interest in science? That was my purpose for getting involved. From what I can see, it appears that the whole scene is being blurred. Take for example, 'science bloggers', they may not be blogging in order to communicate science to a wide non scientific audience. They may just want to share their thoughts and writing with a group of scientists or friends. It depends on the nature of their blog and that is the beauty of blogs - it is up to the individual what they write & who (if anyone) they target it at. The group shouldn't be lumped together as one. The 'Skeptics' seem to like to raise awareness (but sometimes struggle to reach out of their own group) but from what I can see they are trying and are sometimes successful. I do not agree with instant dismissals of papers/information/formulas without first looking at the evidence, which I fear is where the skeptics sometimes let themselves down (and go against the whole nature of being a skeptic). Then there are the science journos, the media bods. I have noticed a change in the way science has been reported over the past 12 months, a lot of science news is reported fully with pros and cons and less of the 'miracle' cure' hype. I know that things aren't perfect and that they never will be, but it is better/getting better. So here there seems to be some winnings! But should they preach to the scientists how they should share their data and ideas before publishing to get a news story out of it? No. The phrase 'science communication' is massively overused and encompasses a whole range of people who are communicating for different reasons and purposes. A lot of this communication goes on 'underground' in blogs etc. Really the only people that actually communicate science to lay audiences are the few 'celebrity scientists' (maybe they will become like celebrity chefs), the journalists, the endless number of scientists that give up their time to do work in schools and science teachers. I think the greatest challenge for all communicators (not just science, science isn't special and greater) is to be accessible to who you are trying to speak to. Not all communications should be targeted to a lay audience, nor should it all be targeted towards the science community, but depending on what you are trying to achieve you need to think about who you are trying to reach out to. I think a lot can be learned from other areas and communications experts. The science community in general has a disregard for anyone that doesn't come from a science background or isn't a scientist. I think science communication is failing here because the two groups (science & communications/PR) are so alienated from each other and more allegiances here would make communications more successful, to whoever you are trying to reach out to. How did you become involved in science communication? Interesting post, and timely, given that TechFest starts on Saturday. I generally agree with your comments, I think "Science Communication" is a bit of an ethereal catch-all phrase, and it's difficult to know the best approach. I think the skeptics do shoot themselves in the foot sometimes, being far too skeptical, and occasionally just having a good moan (I expect there could be a scientist special of Grumpy Old Men in the future!). However, I don't think the field is elite (well not so much in my experience anyway). There are members of staff here at the University who bridge the gap between research and communication, and I have a friend who did her PhD here and now works for TechFest. So it is possible to have "normal" scientist involved at a higher level. The "Rock Star" scientists do have an important role as these are the people that can really reach the masses. But equally, it's down to us bench scientists to try and enthuse people, especially younger generations, about science, and show them how cool it is. Which is why TechFest and other events are really important, and why I will help try and show primary school kids that Chemistry is all around us and fun next week! SooIrish! I volunteered to help out in events and I got involved with the science communication team at the uni. Russ, apologies I didn't really make myself clear with 'the field is elite' comment. I was more refering to within the media circles (the "rockstar" scientists etc) rather than within the university/techfest. Science communication is a big group. You actually missed out a fair few sub-cultures to the "scene" :) museums, outreach, pr, the engagement people, the dialogue people... I'd also add that to a lot of science communication professionals the bloggers and the skeptics are virtually non-entities. And that within each group there are not only arguments, but fractions. Not sure I'd call it a scene either. In many ways it is silly to talk about science communication in general terms because it's so diverse. I'd also say that as the idea of a "shared interest in science [...] and encouraging a wider interest in science" is roughly what a lot of people in the field share, the aims of science communicaiton are entirely up for debate. Indeed, I often ask that as a (discursive) essay question in exams. Dunno if this blogpost is also useful? Thanks for the comment and links Alice. I have never seen anything like that video before! I completely agree with your views on 'levels'. I get quite frustrated with peoples need to categorize everything & stereotype (which was partly the inspiration for my blogpost). I am looking forward to being more involved in writing/talking about science. I am exploring how things are done at the moment and how things can change in the future and learning what I can do. This I think will help me get my messages across (whatever they may be) clearly whilst reaching out to the people I want to communicate with. I think some of the shouty skeptical types should do a bit of teaching. Public speaking is the easy part. It's when you assess the audience later, and see how little of the message got through, that it gets interesting. JDM, that might be an idea. Get more guest teaching in schools! So for certain topics they get an researcher in to talk about it. Or would that be dangerous....? My point would still be that flouncing in to someone's classroom to give a well-intentioned performance can be a pointless exercise unless you do some sort of assessment at the end, to see if the message came across. Otherwise, it's just shooting your mouth of for the benefit of your ego, and wasting the students' time. Yes, are you involved with the STEM ambassador scheme? They do a lot of after school work and they seem to be really supportive of people that wish to work in schools. I've only just found this blog post. You do raise a few interesting points about science communication. I'm not sure if there is a debate raging about the methodology of engaging people in science. How people are engaged depends on who the target audience is which is why there are a number of different methods around. Interacting with the media is one small component in science communication. The potential audience is quite large but it's only a segment of that large audience that anyone targets with a message. I don't think that the majority of science communication is performed by bloggers, tweeps or even on facebook. There is a vast section of science communication that you have missed out like science and technology museums, museums, galleries, art galleries, public displays and the like. And not to mention television shows, (fictional and factual). I think much of science communication is done within education in schools and outreach programs. Thanks for your comment. You are correct I did leave out a large group of science communicators. I should have included them in the post, or at least pointed out their existance! An oversight on my part. I wrote the post when a debate was raging via twitter and in various blogs about the role of bloggers, skeptics & science journalism in science communication (if any). That is why the focus of the post was around those groups. I came across this and thought it was an interesting read and adds to my blog post. A discussion about how and if 'big society' in the UK should tap into discussions going on in the Skeptics in the pub.